During the 1930s, there was a tremendous migration of families, mostly farmers, from Oklahoma, Arkansas, Texas, and other states in the Southwestern Great Plains to California. These families were escaping the ecological disaster that later came to be known as “the Dust Bowl.” The families headed to California with high hopes of a better life but often arrived penniless and hungry, with no immediate prospects for employment and no place to live. They became known as the “Okies”; many found refuge in camps operated by the federal government. The most famous of these camps was the Arvin Farm Labor Supply Center, now known as the “Sunset Camp” or “Weedpatch Camp”, located just south of Lamont. In 1937 this camp housed approximately 300 people in one room tin cabins and tents. The Camp provided a safe place to live for many families, and resulted in a strong community that created its own school and later became the inspiration for the Weedpatch Camp, memorialized in John Steinbeck’s acclaimed novel, The Grapes of Wrath. Originally constructed by the federal Farm Security Administration, the Sunset Camp was operated in the 1940’s by the War Food Administration and Production and Marketing Administration. 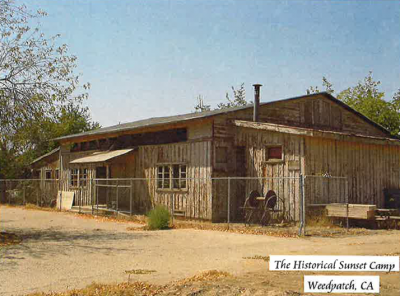 Between 1947 and 1950, the Camp was leased to a group of growers who operated it until the Public Housing Administration took title and the Housing Authority of the County of Kern assumed operation in 1950. On May 24, 1965, the Sunset Camp was deeded over to the Housing Authority. The camp continues to operate as a migrant camp today, with the 88 units open six months per year and operations subsidized by the State of California Office of Migrant Services with the United States Department of Agriculture providing funding to modernize the migrant units. At one time, the Camp had over twenty full-time employees with nurses, doctors, dentists, social workers, maintenance workers and management staff. Today, the Camp operates with three employees. Few people realize that three of the original buildings from 1930s era camp: the Community Building, the Library, and the Post Office, are still standing on the site of the current Sunset Camp. These are the only original buildings left from the Dust Bowl era in any camp in California. One of the buildings actually appeared in the movie, The Grapes of Wrath. A dedicated group of local citizens has formed the Dust Bowl Historical Foundation, Inc., a non-profit corporation, to preserve artifacts, lore, and the history of the Dust Bowl migration. The Housing Authority of the County of Kern is working with the Dust Bowl Historical Foundation Committee on this important undertaking. Since the Housing Authority owns the land and the historical buildings, its cooperation is essential for the success of the project. The buildings are listed on the California Register of Historical Resources and the National Register of Historic Buildings.